Panino is a chic Italian word that translates to little roll or little bread. We think of it as an Italian sandwich. America has caught onto panini in a big way but nothing that the Italians would recognize as the real deal. Stacked with cold cuts, pickles, cheese, oozing with dressing, and needing instructions as to how to get your mouth around it, you might as well call it a sub. In Italy there are rules as to what a panino really is and if you order more than one, the plural is panini, not paninis (the Italians really cringe when they hear that). To make a classic panino, you need good bread like a cibatta, something that has character and an interior crumb that will not overwhelm the filling; there should be no more than 4 ingredients ever! A panino never is lathered with mayonnaise or some gooey, spicy dressing either. The bread is simply brushed with a good extra virgin olive. The filling ingredients typically are prosciutto, salami, mortadella or some other meat filling, and never more than one type of meat is used. Sliced tomatoes, roasted vegetables and cheese like mozzarella, fonrtina, provolone or scamorza are some of the other essential ingredients. Panini are served at room temperature or hot when pressed in a panini maker. Brush the cibatta slices with olive oil. 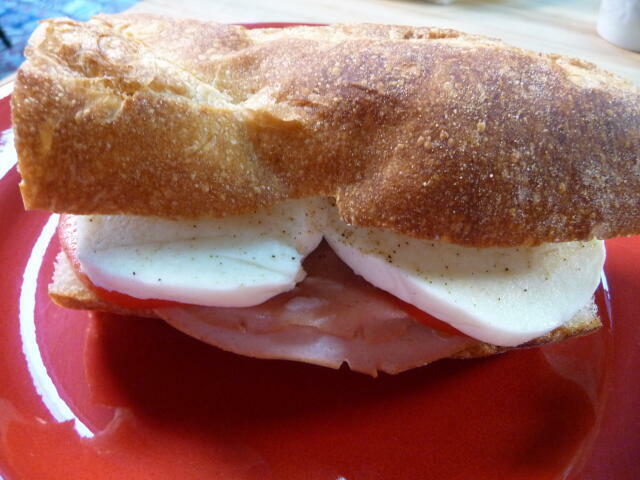 Place three slices of mortadella on one cibatta bread and cover with 2 slices of mozzarella and two slices of tomato. Top tomato. Add salt and pepper to taste.